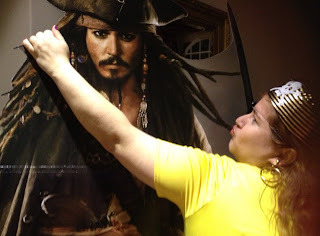 SARA - Sassy in the South: Southern Speak - RWA Conference - Always Worth It! Southern Speak - RWA Conference - Always Worth It! I have been a member of RWA for a number of years now and the one thing I love is the feeling of excitement and camaraderie from the annual conference. It’s even more exciting to see how things come together when you are part of the conference team. I have been on the conference team for two years in a row. I have to say though with a bigger team, I was able to see more of the actual conference than I had last year. This year’s conference committee - those in sailor hats - has been at it for over two years (some three as they had bid for the conference to be in Fremantle). Lots of emails, chats, discussions all culminate to the well-oiled machine delegates see. I never knew myself as a delegate how much planning it takes. Every single little thing that you see had be organised by somebody. 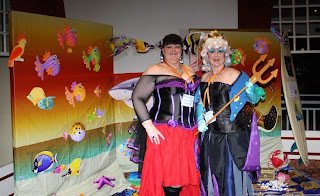 This year’s Riding the Waves conference at the Esplanade Hotel in Fremantle, had been headed by Leah Ashton and Nikki Logan, the dynamic duo as I like to call them. Nikki is also RWA’s president! (amazing!) I truly want to be like these women when I grow up. They led the way in making this a chill-out and green conference, and I as a delegate and team member was ecstatic with the result. So what did the conference have to offer? Destiny Romance had a lovely welcome reception, which was a fun night of catching up with faces I haven’t seen for a long time. They also had these groovy bags and books as gifts. The first ever Academic Conference (the Elizabeth Jolley Conference) by Curtin University in association with RWA. It was a day where academics and romance writers met and discussed the academic side of romance writing. The Friday Workshop with Kim Hudson, author of The Virgin’s Promise, which introduces a new feminine story structure in the way that Joseph Campbell introduced the structure for The Hero’s Journey. The Nautical or Nice cocktail party was fun. Being the co-ordinator, I was so happy with how my team of helpers took my instructions and run with the set up. 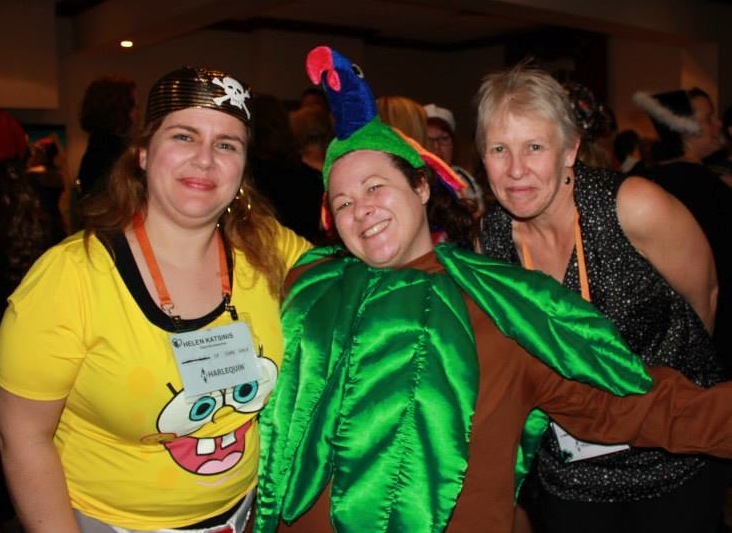 Presented by Harlequin Australia, the costume competition was a highlight. There were palm trees (Ms Paula Roe), pirates, wenches, sailors, and even Julie from the Love Boat (Ebony McKenna) and a whole lot of niiiice. 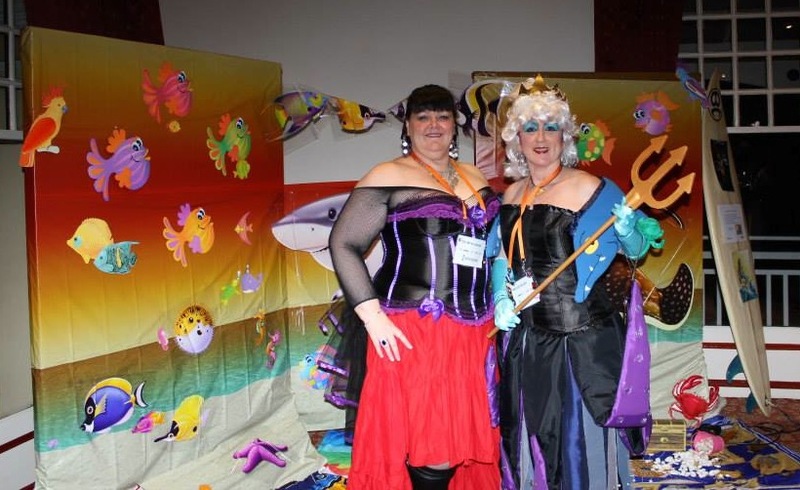 Our own Maggie Mundy came third with her Sea Witch costume. First was Olive Oil and Popeye (ie. Melanie Milburne and her hubby). I had fun going as a Spongebob Squarepants (squareskirt, I should say) Pirate . But my fave thing from the whole night - Captain Jack Sparrow! Julia Quinn as keynote speaker. I loved her tales of being disorganised (I soooo related!) and her belief you won’t hurt your career by helping another writer. Go Julia! 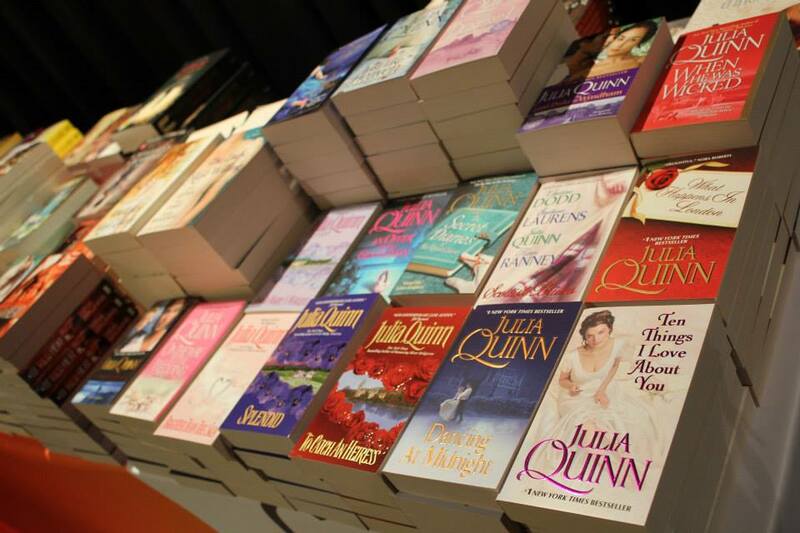 The wonderful selection of workshops wrangled by Rachael Johns was so hard to choose from. On Saturday, I attended two workshops. Laura Bradford revealed home truths about agents, making them less scary. They are people too you know J While it’s hard to get an agent because of the number of queries, I came away thinking, that there is an agent out there for everyone and that timing is a key factor. Margie Mason’s Presenting with Pizzazz was a great session of tips and pointers of how to feel the nerves but to get on with presenting with fun and confidence. We even blew bubbles! Sarah Wendell’s Blogging 101. Sarah is funny, astute, and such an advocate for the romance writing industry. I loved her honesty and how she interacted with the audience. Kim Hudson’s The Voyage of a Writer, was a continuation on the Virgin’s Promise but for the writer themselves. I regretted not having done her workshop on Friday as she was a warm and generous presenter. Shona Huk and Nicola E. Sheridan’s Beating the Tsunami: getting ahead of the paranormal trends. I loved this workshop by the vibrant tag team. I mean the session started with a mean track by Rob Zombie. How appropriate! They went through unusual creatures that could be terrifying but could have hero status if you dared but try. Such fun! Submission Island - an excellent panel where stories were read out anonymously and the agents/editors had to put up a card saying ‘stop’ or ‘more’. Hearing what the panellists liked and what they didn’t like and why, was invaluable. Good luck to those who got requests. I have to say all the plenary addresses by Kim Hudson, Nina Bruhns, and Sarah Wendell were all inspiring. The Chillout lounge by Rachael Johns and Carolyn Wren was a nice touch. I know the newbies met in there on more than one occasion. The Pitching was so well organised. I have to give a shout out to Michelle Diener who was the pitch witch J. Pitching is always nerve-wracking, but I think the cool, calm work done by the pitch team helped settle nerves. Again the list of editors and authors was impressive. There was something for everyone. I did get a request from Alisa from Twelfth Planet Press, so fingers crossed. The wonderful bookstall set up by the Co-Op UWA. They even had free postage to an Australian address. Now that’s service! 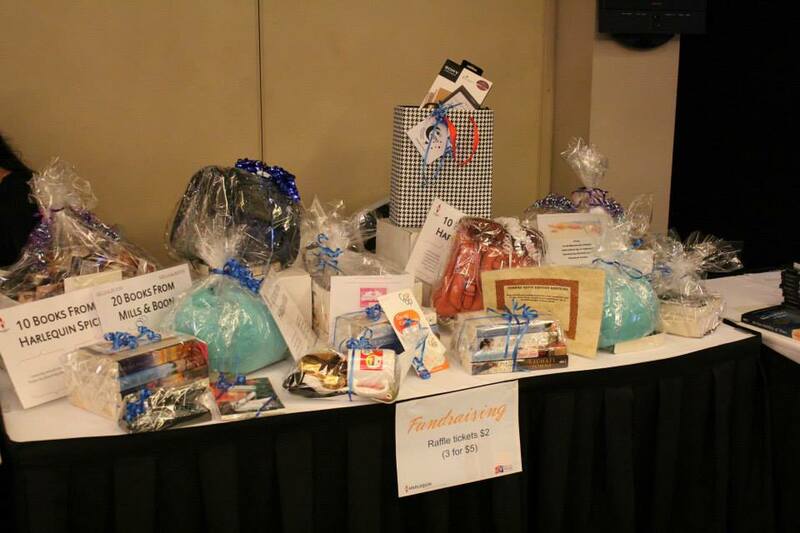 There was a goodie table, a swap table, a fundraising table - this year the fundraising charity was Read Write Now, a literacy organisation helping Western Australians with literacy issues, and of course the lovely door prizes. An amazing MC in Jennie Jones. What a wonderful voice! I was also impressed as a sponsor (I sponsored - I, wi-fi for Saturday as HelzKat Designs). I have to say the only negative about conference is that you can’t have a long conversation you want to with everyone. It’s the nature of the beast. But a quick hug is better than nothing, I say. and to all the volunteers who helped on the weekend. You are all stars! So why not see a conference from the other side - as part of the conference team or a helper. It's definitely worth it. Riding the Waves truly was a great weekend! What a fantastic round-up, Eleni, but you missed one person off the list who deserves a shout of thanks...YOU! Thank YOU for all your work. 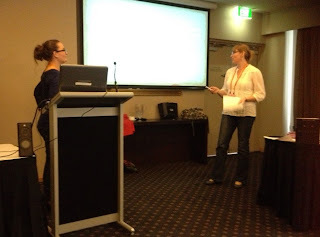 I loved the Freo conference. It was very well organised - not that I expected anything else from an RWA conference team - and the vibe was brilliant. I'm so glad you loved the conference. It's music to my ears. Indeed. It was fun and inspiring, and you guys worked really well together. Totally a joy working with you too, Rach! LOL - yep long live disorganisation!!!! and thanks for the well wishes. You know the sad thing with conference over is that the emails from the team have stopped :( so miss hearing how everyone is doing. fingers crossed for your sub to Alisa. Crossing them for your sub. UP CLOSE with out-and-about writer Lilliana Rose!